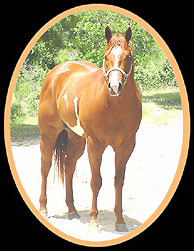 We had plans to breed Drake to several of our mares in 2005. He was just such a gentleman. He will definitely be saddly missed. As far as his disposition goes, he is very huggable, quiet, willing, and very receptive to all that is asked of him. He has very good halter manners and has never had to have a chain in his mouth, over his nose, or even under his chin. He doesn't even know what one is. In fact at home I lead him around without even a halter on. 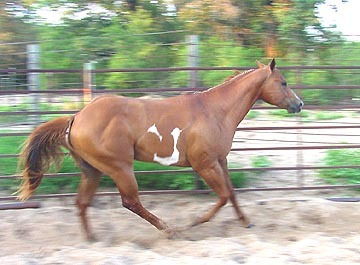 He was videoed 02-27-04 being ridden bridless. 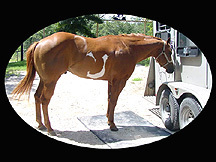 Lope, trot, and walk, transitions, stopping and backing, turning, figure eights etc. 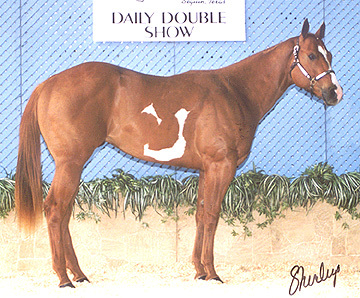 Feb 18, 2004 ~ Drake was shown at Halter for the very first time. Took a 1st and 2nd out of 6 in Am Halter Stallions earning 3 APHA points durring the APHA Show at the SA Stock Show and Rodeo. He also took a 2nd and 3rd out of 8 in the Jr Trail Class. 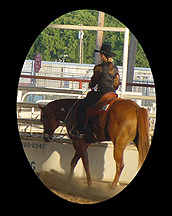 Earning 1 APHA point in that event. 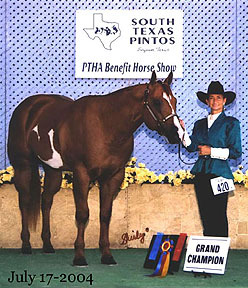 May 8-2004 ~ Drake recieved a 3rd and 4th of 12 in Am Trail earning 3 APHA points in that event. 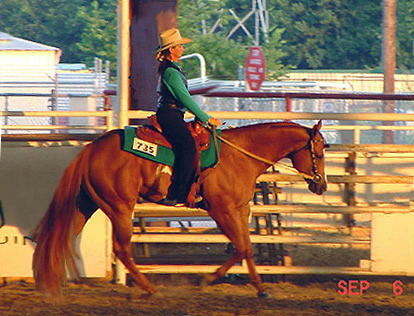 He also recieved 2 2nds in Am Halter and 2 2nds in 2&3 Yr Old Halter. After only 90 days of training under saddle he was taken to his first show (APHA) where he took a 2nd & 3rd in Open Trail out of 8 and a 2nd & 3rd in AM Trail. At his second Show (PtHA) with just 115 days under saddle he took a 1st and two 2nds in the 2yr old Snaffle Bit Western Pleasure, two 1sts and a 2nd in the Open Western Pleasure. Three 1sts in Open Trail and three 1sts in Am Trail. No one can believe he is only two years old and is still a stallion, with his sweet, quiet, willing disposition. A cute little head and sweet eye. Looks a lot like his great grandfather, Conclusive and is a real eye catcher. 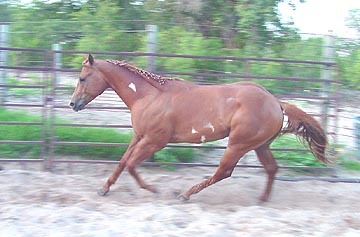 This colt is AWSOME...He has the breeding and potential to be a great all around horse, and is already well on his way. Drake took a 1st, a 2nd and a Grand in Halter. He stands for shoeing, grooming, clipping, & bathing. 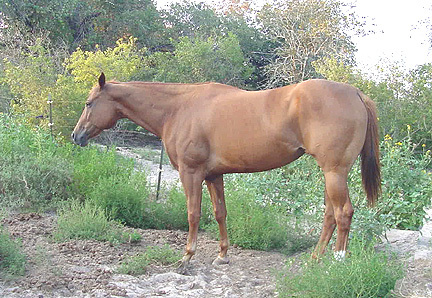 He hauls, is quiet, has great conformation and is well balanced and well muscled. Very receptive to light cues. We'd like to take this opportunity to thank everyone for their kind words and inspiration at our time of sorrow. Please feel free to sign Drake's Memorial guest book with your comments and thoughts. This morning Drake was let out of his stall to run, play, buck, and be a horse for a while. He was happy to be alive and had a very good time. He was put back in his stall at approximately 12:30pm. Upon returning at 4:00pm he was found dead. It was a sudden death as there were no signs of thrashing what so ever. We are so thankful that he did not suffer and that he was able to enjoy the last moments of his very short life. Only the good die young. 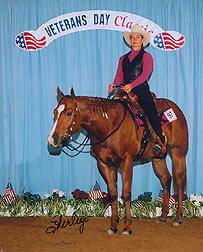 This was a great horse with a great life and show carreer ahead of him. He had the kindest, softest, quietest eye that reaches deep into your heart and soul. He is gone now but will not soon be forgotten.